Trail of the Coeur d'alenes, a photo by Southworth Sailor on Flickr. 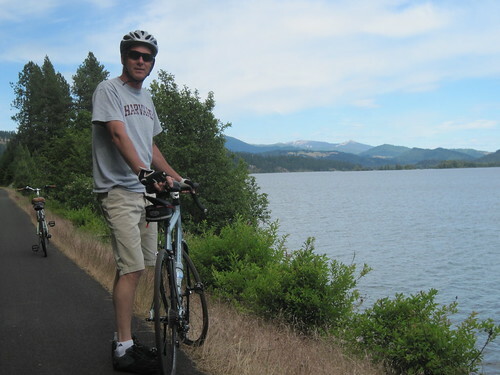 We just returned from a three day getaway exploring some of the North Idaho bicycle trails. We spent two days on the Trail of the Coeur d'alenes. The trail begins up on the palouse, descends to the lake, then meanders along several lakes and the Coeur d'alenes River up to the town of Mulan near the Montana border (72 miles). Our time was spent on the lower portion from Plummer to Cataldo. Our longest day was 54 miles from Harrison to Cataldo and back. There is only one town on this lower portion, the lakeside hamlet of Harrison. It became our launch site and destination for daily rides. The trail is built on an old rail grade so it is relatively flat. We enjoyed the beautiful scenery of lakes, rivers, mountains and fields as we pedaled side by side talking and listening to the abundance of birds and occasional river traffic. The temperature was a very comfortable 80 degrees for most of the time. Our lodging for the two nights was a bed and breakfast in St. Maries. It was an unique experience in which we interacted significantly with the host family and other guests. It wasn't the most private of accommodations, but it sure gave us a strong feel for the local culture. Our last day was spent in and around Coeur d'alene, exploring the bustling town and checking out the east end of the Centennial bike trail (with sore bottoms).